The Monuments Men, based on a 2009 book of the same name by Robert Edsel, tells of a small group of mostly middle aged men who risked their lives to recover thousands of looted works of art from the retreating Nazis in the final days of WWII. If you’re like me, that means movies that center on story and even dare to depict personal heroism. Explosions and digital effects, if present, are subordinate elements. 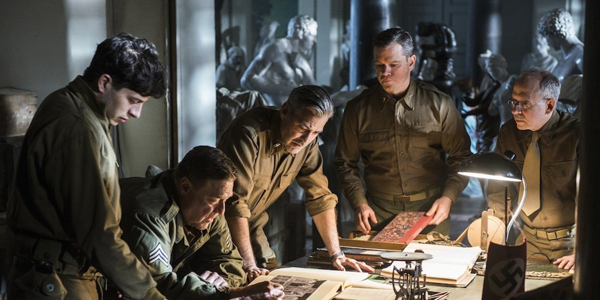 The Monuments Men has not fared well with reviewers. In an obvious comparison to Saving Private Ryan, another quest/buddy movie set in WWII, The Monument Men lacks tension at many points. The Post review gives a plausible analysis of the structural cause of a lack of focus in the central part of the movie, that resolves in the ending sequence where the team races to save several key artistic treasures from destruction by the Nazis and capture by the advancing Russian army. Whatever its flaws, I enjoyed The Monuments Men and recommend it as a good story that poses key questions on the way a people’s art and history is central to their identity, something Hitler knew very well when he tried to erase it from the lands he conquered. This entry was posted in Culture, Movies and tagged Culture, movies, The Monuments Men. Bookmark the permalink. This does sound like a good one. I’ll be watching for it when it comes out on DVD. Thanks for the heads up. Good review Morgan. The cast could have definitely been given more to work with here, but at least they’re charming and pleasant enough to have a good time with. I wish now I’d already read that book on stolen art treasures that I’ve got somewhere stored in the loft! Coincidentally, I’ve just seen Robert M. Edsel, author of the book the film is based on, interviewed on BBC television. That book I’ve got in the loft is The Lost Masters: Looting of Europe’s Treasurehouses, a singularly long and detailed study which I may or may not get round to reading properly. Ho hum.